It may be winter, but this is no time to shelter in place. In the past month alone, we’ve seen at least a half dozen restaurant openings—from high-profile ramen to Asian-inspired bar bites to Jamaican comfort food. Put home-cooked meals on hold for a while and start making your reservations at some of these hot spots now. Prepare for a wait of up to two hours at this new Spanish tapas restaurant in the old La Urbana space. Barvale is the place to be, and for good reason. It’s a fun, lively spot and a great addition to Divisadero’s exploding restaurant scene. Order a gin and tonic and pintxos (small bites) from the bar to snack on until your table is ready. Once you’re seated, go for the boquerones (if you’re not opposed to anchovies), Basque piquillo peppers, octopus, braised oxtail and paella, of course. Jamaican food and flavors are the name of the game at this new spot from Daniel Patterson’s Alta Group. Think salt fish fritters with chimichurri sauce and jerk chicken with plantains. Cast your judgment aside and try the black pepper tofu with ginger—it’s one of Patterson’s personal favorites. Did we mention the Zap Pow punch bowl (blended rum, blood orange, passion fruit, grenadine and jerk bitters) for four? Now we’re talking. It’s not often that we go to a bar specifically for the food, but the new Bar at Hotel Kabuki is serving up crave-worthy bites that pair perfectly with its killer cocktails. The usual suspects include fried wontons and veggie tempura, which all work well to soak up drinks like the beautifully (and naturally!) bright purple Madame Chou (tequila, butterfly pea flower tea, lime and grapefruit soda). Confession: We want to have the karaage chicken (chicken thighs, soy, ginger and spicy mayo-sriracha sauce) and golden tea milk punch (gin, turmeric, cinnamon matcha tea, coconut cream, Madagascar vanilla) every single day. We’ve been waiting patiently for what feels like years now for chef David Nayfeld’s handmade pastas. Once it opens, Che Fico might easily become everyone’s favorite new spot for rustic Italian fare. We hear there’s even a dedicated charcuterie room, authentic Italian fare and climate-controlled pasta lab. The highly anticipated restaurant by celebrity chef Ayesha Curry (wife of Warriors MVP Steph Curry) and restaurant star Michael Mina opened to much fanfare last November and has been turning out globally inspired eats with a barbecue bent to hungry patrons ever since. You might have to wait a few months for a reservation, but it’s worth it to try the pork ribs; curry cornbread muffins with Thai red curry and coconut milk; and Kalua “instant bacon” (steamed buns loaded with smoky meat, pineapple salsa and teriyaki). 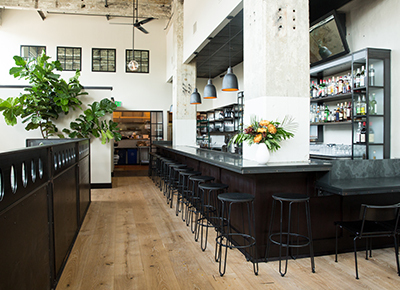 This chic new addition just off downtown Berkeley’s main drag comes from the folks behind Hayes Valley’s beloved (and now shuttered) Two Sisters Bar & Books. Inside, it’s the kind of casual yet fancy combo that’s perfect for a relaxed date night—which you should kick off with a glass of negroni-like Sbagliato Morro (Campari, vermouth, sparkling wine and roasted blood orange juice) and fried chickpea batons with harissa aioli. Share the half chicken and root vegetable cassoulet with your sig-o and then call it a night. You’ll be home to relieve the babysitter well before the clock strikes 12. Intended to be a more casual offshoot of her two-Michelin-star restaurant Atelier Crenn, the soon-to-open next-door wine bar from Dominique Crenn will be an homage to French classics like tarte flambée and pommes soufflé. Eager diners can even anticipate recipes donated by French masters like Alain Ducasse. Pâté en croûte and Breton lobster, anyone? Diners who come to Ippudo are very serious about their ramen, and for good reason. The wildly popular international chain officially has two Bay Area locations, so San Franciscans can now wait for a table without having to cross the Bay Bridge. Come hungry, but not too hungry—the restaurant is notorious for hours-long lines to slurp its signature tonkotsu-style ramen with rich creamy broth, hand-pulled noodles and chashu pork. At almost $20 a bowl and no doggie-bag or take-away option (against house rules), you’ll want to eat your share. Until now, there hasn’t been much reason to hang out on Treasure Island. But we bet you’ll find yourself relaxing there on the next balmy weekend afternoon. Located on the island’s great lawn, the new restaurant—made entirely out of shipping containers—boasts a beachy waterfront vibe and sweeping views of the city skyline. And that’s just the half of it. You can also look forward to the signature fish and chips with homemade tartar sauce and a twist on the classic margarita with cucumber and Old Bay seasoning. Longtime city residents grieved when classic SF restaurant Range closed its doors last winter, but there’s good news on the horizon in the form of a ’60s-themed cocktail bar by Range chef/owner Phil West and his partners in The Treasury. Details are scant, but we’ve heard there will be fondue, mid-century kitsch and drinks named after icons like Marilyn Monroe—because what’s more throwback than that?